MediMiss Cancer Diet Dieting Food Healthy Diet Food to Gain Weight Health Nutrition lose weight menopause Nutrition Nutrition and Health osteoporosis perimenopause prostate weight loss Wonder Food For Women! The humble soybean boasts some extraordinary benefits. This nutritional powerhouse has stayed under wraps for too long. Apart from being the only vegetable protein with all 20 amino acids essential for our health and well being, the humble soybean has many other virtues...including an excellent foundation for fast, safe weight loss program. According to Dr David Heber in "The LA Shape Diet", women who are on a weight loss program need about 100 grams of protein per day to fight against hunger and to build their best personal lean muscle shape whilst still losing weight. Without the appropriate level of protein in a low calorie diet, people and women in particular, risk losing 1 pound of muscle for every 4 pounds of weight lost! This potential muscle loss can be very dangerous as it can cause a weakening of the heart and other vital organs. Dr Heber recommends soy-protein shakes or soy-protein fruit smoothies as a safe and healthy way to achieve fast and permanent weight loss. Apart from some absolutely wonderful health advantages, soy is a safe protein source - without the unwanted cholesterol and saturated fats that accompany animal protein sources. Soy will support and does not sabotage a low calorie weight loss program. Read on to discover some other wonderful health benefits of this incredible this food source. 1. Soy contains health enhancing isoflavones. Isoflavones are compounds found only in plants which have strong antioxidant properties. These compounds repair, and help prevent damage to cells caused by pollution, sunlight, and normal body processes. Free radicals can easily cause harm to the immune system, whose cells divide often. They may also be responsible for some of the changes of aging. 2. Reduce risk of heart disease. 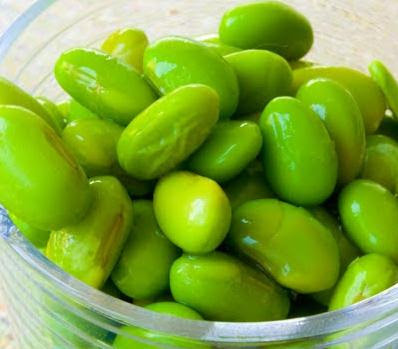 Soy's protein and isoflavones lower LDL cholesterol and decrease blood clotting, which reduces the risk of heart attack and stroke. In one study, people who drank a "milk shake" containing 25g of soy protein for nine weeks experienced, on average, a 5% reduction in LDL cholesterol. And people with the highest LDL levels experienced a 11% drop. (For each 10% to 15% drop in the LDL level, the risk of a heart attack decreases 20% to 25%). 3. Protection against cancer. Soy's soluble fiber protects the body from many digestive related cancers, such as colon and rectal cancer. While its isoflavones may protect the body from many hormone related cancers, like breast, endometrial (uterine) and prostate cancer. Isoflavones act against cancer cells in a way similar to many common cancer-treating drugs. 4. Counter the effects of endometriosis. The isoflavones in soy products may help to offset the action of the body's natural estrogen, which is often responsible for instigating the monthly pain, heavy bleeding and other symptoms of endometriosis. 5. Protect against prostate problems. Eating soy products may protect against enlargement of the male prostate gland. The size of the prostate gland tends to increase with age, causing various types of urinary difficulties, including frequent nighttime awakenings. 6. Guard against osteoporosis. Soy's protein enhances the body's ability to retain and better absorb calcium in the bones, while its isoflavones slow bone loss and inhibit bone breakdown, which helps prevent osteoporosis. There is evidence to suggest that isoflavones may also assist in creating new bone. 7. Control symptoms of menopause and perimenopause. Soy's isoflavones help the body regulate estrogen when this hormone is declining or fluctuating, which helps alleviate many menopausal and PMS symptoms. Research has shown that soy isoflavones can reduce menopausal hot flushes in women. 8. Help control diabetic conditions and kidney disease. Soy's protein and soluble fiber help regulate glucose levels and kidney filtration, which helps control diabetic conditions and kidney disease. What an incredible little bean! With such profound health benefits how can you overlook this wonderful food source? If you haven't yet noticed, gone are the days when the only way soy products came were in strange tasting meat substitutes. You can now access a wide range of soy products and use soy in a variety of ways to suit any taste palate.